Tuesday’s Revolving Book is the award winning historical suspense FLAHERTY’S RUN by HENRY HOFFMAN. 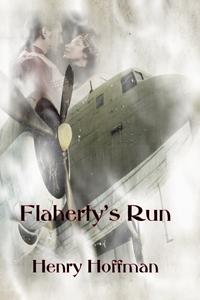 Flaherty’s Run… 1st place winner of the Southwest Writers Annual Award in Historical Fiction. The war is not over for Will Flaherty . . . While recuperating at his home in North Florida from injuries suffered in World War II, Will is startled when an escaped German prisoner of war, Max Scheffer, unexpectedly shows up on his doorstep. To complicate matters, his sister Carol, a former volunteer at the facility where the German was being held, is involved in a romantic relationship with the escapee. At her urging and to settle an old debt relating to his wartime past, Will relents and provides the POW a ride to the Florida Keys where, according to the German, a plane will be awaiting to whisk him out of the country. The closer they approach their destination, however, the clearer the intentions of the German become to Will, for what Max has in mind is not an escape but the ultimate revenge for his nation’s defeat. Henry Hoffman is a former public library director and newspaper editor whose fiction and non-fiction works have appeared in a variety of literary and trade publications. He is the author of two previous novels, Bound and Drums Along the Jacks Fork. Along with his works of fiction, he has contributed articles to a number of standard reference works, including America: History and Life (ABC-CLIO), Historical Abstracts of the United States (ABC-CLIO), the Encyclopedia of Flight (Salem Press), the Encyclopedia of Natural Disasters (Salem Press), and the Encyclopedia of Library and Information Science (Marcel Dekker).